Why choose an engineering job with Capital? During the course of your job hunt, you put a lot of time, effort and patience into not only applying for jobs directly but also communicating with recruitment agencies. We speak to many candidates who have invested their time into speaking with recruitment consultants who promise to send their details and CVs through to an organisation, only to never hear from them again! Agencies will often submit a candidate to a role, only to fail to pass on any feedback from the client if the application was unsuccessful, leaving the candidate guessing. This can become frustrating and tiresome for candidates, not to mention damaging to the agency’s ongoing relationship with them. All Capital consultants are trained to keep you informed throughout the process, whether you are successful or not. At Capital, we are fully committed to providing the highest level of customer service possible, not only to our clients, but also to you – our candidates. We believe this sets us apart from other agencies. So, what’s involved in our Candidate Care Programme? We will NEVER submit you for a role without your permission. We always request the right to submit, and give written confirmation of all the details of the role to which you are being submitted. We handle all of the negotiations throughout the entire recruitment process, from interview to placement, to make things as simple as possible for you. We ensure that you are kept up to date with all communications with the employer. We are committed to quick communication with you. You will receive a response to any queries within a working day. If the required person is not available their out of office will be on with an alternative contact, so everyone is kept in the loop. We will be in constant communication with you throughout the interview process. You will get thorough pre-interview preparation; including details about the interviewer, their role, and what they are like. We’ll let you know about the culture and environment of the company you are considering. We always give you feedback we receive from clients. We ensure you will receive clear, easy-to-understand contracts and joining instructions, so you know exactly what you need to do when you start. So no surprises in your first week! We will call you once you are onsite and settled to see how you are getting on, and to help with any issues you may have. We take an active interest in how you are getting on in your role and settling into your new life. We will send you a pack of information about the local area. Where possible we will let you know about other Capital contractors, so you are able to go to them for advice if needed. You are always welcome to contact us with any problems. After you have been placed in a role you will receive a survey for feedback on your experience to help us improve. We ensure that you will be paid on time, every time. There are regular visits to client sites by Capital staff. All placed contractors are met, and if time allows a social event is organised. Many of our candidates enjoy long-term relationship with us. We have a current candidate we first placed in 1996! Another that worked through us for 26 years, over half his life, before going permanent in the final role we placed him in. By working closely with people long-term, we are able to vouch for them to the clients as well as understand exactly what they are looking for in a role. 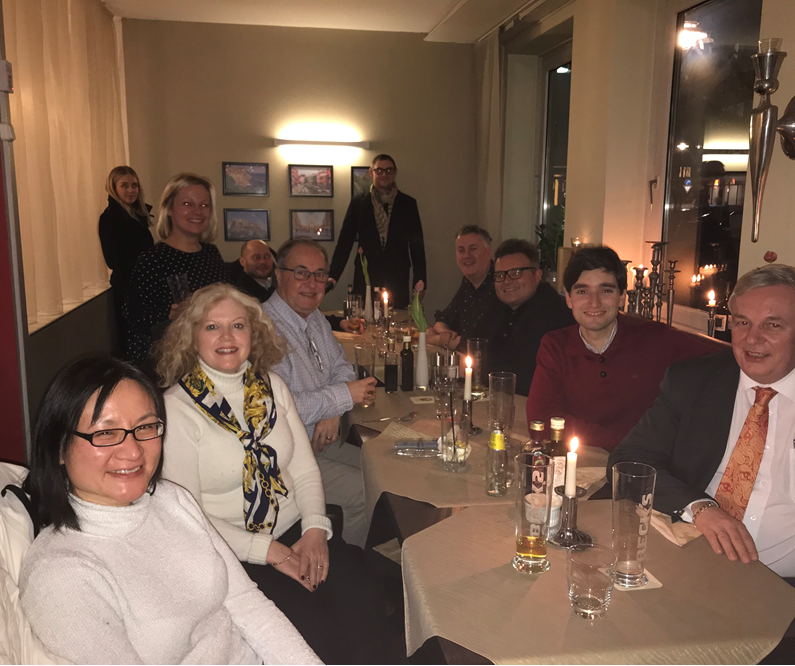 Our German candidates out for dinner with Karen Silk, Director and Claire Hunter, Managing Consultant.